The rain that came across Ireland on the weekend seems to have missed the Blackwater catchment altogether. 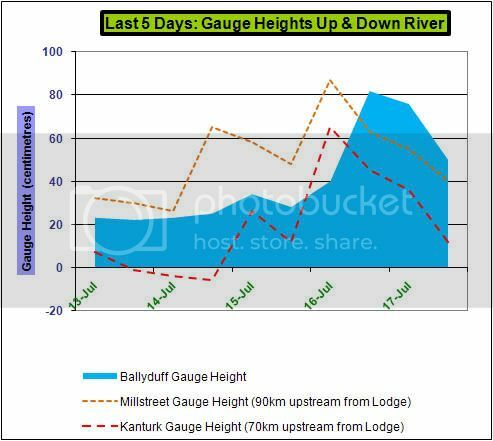 The river is still at 0.08m at Ballyduff and there has been no rise at all on the upper river. On a brighter note, the Metcheck forecast for Cork is giving 13mm rain on Thursday & 17mm on Friday night. This seems to be borne out by the Bbc.co.uk forecast as well. in the last 4 days which is superb in the current conditions. In the morning it was 0.23 & fell to 0.20m by nightfall. Clarity 2-2½ feet. Seven of the fish were caught in a 2 hour "moment of madness". Here's the latest picture on river levels at 18.30 this evening (Sunday 17th.). Biggest Fish of 2010 caught on Saturday, August 7th. - on fly! on a small gold shrimp pattern on the Lug Pool on Lower Kilmurry gillied by Connie Corcoran. Connie estimated the fish @ 14-15lb. and it was quickly released. Gavin & Connie caught five fish for the day, releasing four. 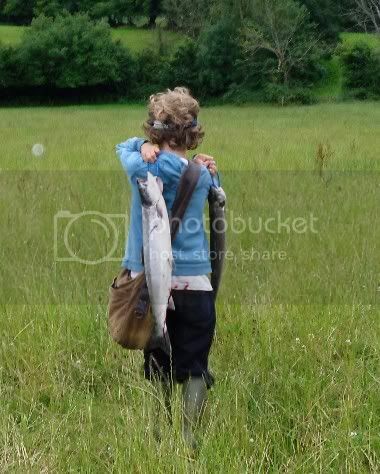 There were eleven fish caught for 10 rod days yesterday - the best day so far for August. Martin Heffer (UK) caught his first ever salmon and it was on fly on a guided day with Glenda. Total for the month is 31 fish for 41 rod days. Gauge height is 0.15m & clarity around 5 feet. Plenty of fish showing in the pools on the lower river and some fish running every day. Since the very good day we had last Saturday, fishing has been moderately good & quite consistent. In the last 6 days we have had 25 fish caught - between 3-5 per day with no blanks days. An average of just over 6 rods/day have been fishing. Fishing is quite hard, with catches below what one would expect for the number of fresh & resident fish being seen. As someone said "The only thing they're taking is no notice!" but very small flies & very long leaders are the name of the game. Total for August to the 13th. is 56 for 106 rod days. Total for the season is 266 for 719 rod days. The river is once again very low, but some fresh fish are still running in. With the huge numbers of fish waiting in the estuary & out at sea, the first flood we get should produce spectacular results for the river. Sept. 19: 19 fish for 16 rod days. 12 released. Best fish 10½lb. 6 on fly, of which 5 came from Beat 1 including 3 sea-liced 8 pounders. Sept. 20: 13 fish for 17 rod days. 12 released. Best fish 8lb. 6 on fly. 26 fish for 17 rod days. 24 released, but 14 were fresh. Best fish ~16lb. released. Only 3 on fly. 15 taken on shrimp, of which 11 were caught by one rod on an upper beat - all were released even though 7 were fresh. 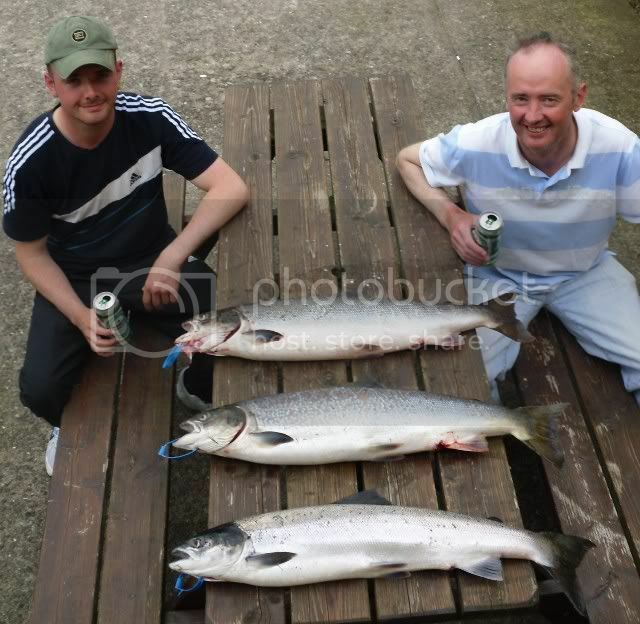 There are a number of fresh fish being caught on the upper beats, even though these have only been very lightly fished. 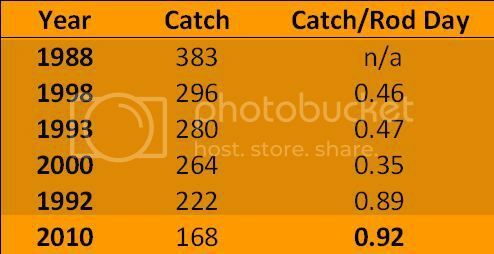 119 fish have been caught in the last week for 11 rod days. Total for September is now 225 & for the season is 541. The upper river rose 50cm & peaked at 10.00am this morning. It's dropped 20 cm by 6pm. The gauge at Ballyduff was up 2cm to 0.12m at 3pm, but there is a fair dirty flood on the Funcheon which may bring it up rather more. prospects looking very good for the last week. from Saturday 25th. to the 30th. There are a limited number of places available which will be allocated on a first-come first-served basis. This was the Blackwater below the Lodge at 4pm yesterday – December 6. The temperature never rose above -2°C all day. Hopefully the weather will be kinder in the run-up to the Opening Day of the 2011 Season on February 1st. 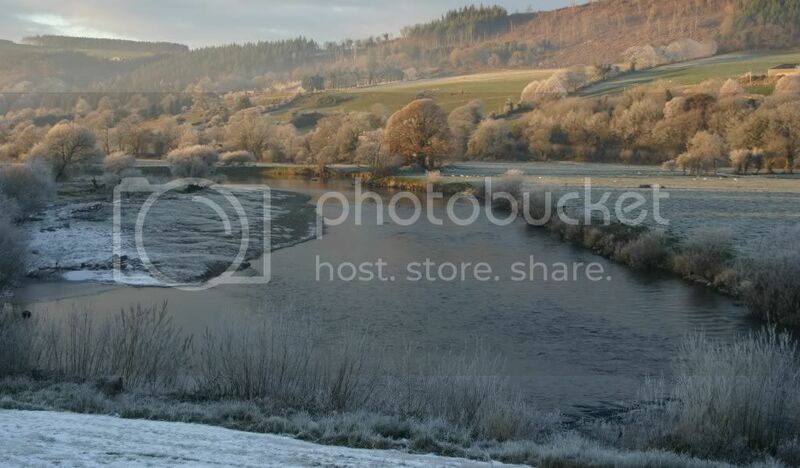 It was the coldest December on record in Ireland, and for the first time since 1601 the Blackwater froze over completely at both Fermoy & Cappoquin. This was the front page of the local newspaper on December 23rd. Here's some pictures taken over the last week or so. Looking upstream from the bridge at Ballyduff on December 16. Looking downstream from the bridge at Ballyduff on December 16. The river below the Lodge on December 16. Looking upstream on the tidal reaches towards the railway bridge at Cappoquin on Christmas Day. Looking downstream on the tidal reaches from the bridge to the town of Cappoquin on Christmas Day. Looking upstream on the tidal reaches from the bridge at Cappoquin on Christmas Day. Looking upstream on the tidal reaches at the Kitchen Hole at Cappoquin on Christmas Day. Looking downstream on the tidal reaches at the Kitchen Hole at Cappoquin on Christmas Day. Thank goodness, the Big Freeze is finally over now. This was the river below the Lodge on December 28. Following the very cold spell in December, conditions are now much milder with air temperatures of +8-10C. but we have just had a well-timed flood which has brought the water temperature and level up. This bodes well for the Opening Day on February 1st as it will help to encourage early springers to run. 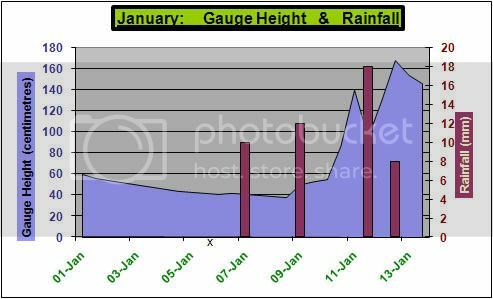 The graph below shows the rainfall and river level so far for January.